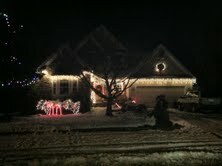 “Yard of the Month” for December is awarded to the home with the best holiday decorations. This year we have a tie. Congratulations to David and Christine Powers at 2628 Iman and Chris and Laurie Burchell at 8414 Yucca. Thank you for helping to make the season merry and bright! Judging was conducted by a panel of three who ranked their top 3 choices. The rankings were consolidated and the lowest overall scores were declared the winners. Thank you to Jennifer Magee and Mimi Raub who assisted me with the judging. Last week we talked about the first two projects: A. 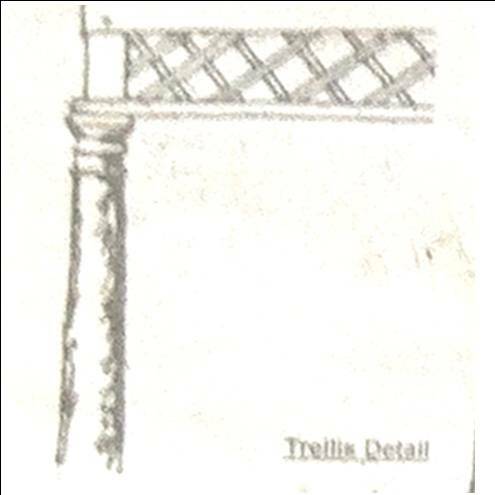 The Trellis (Pergola) and B. Fence and Gate. 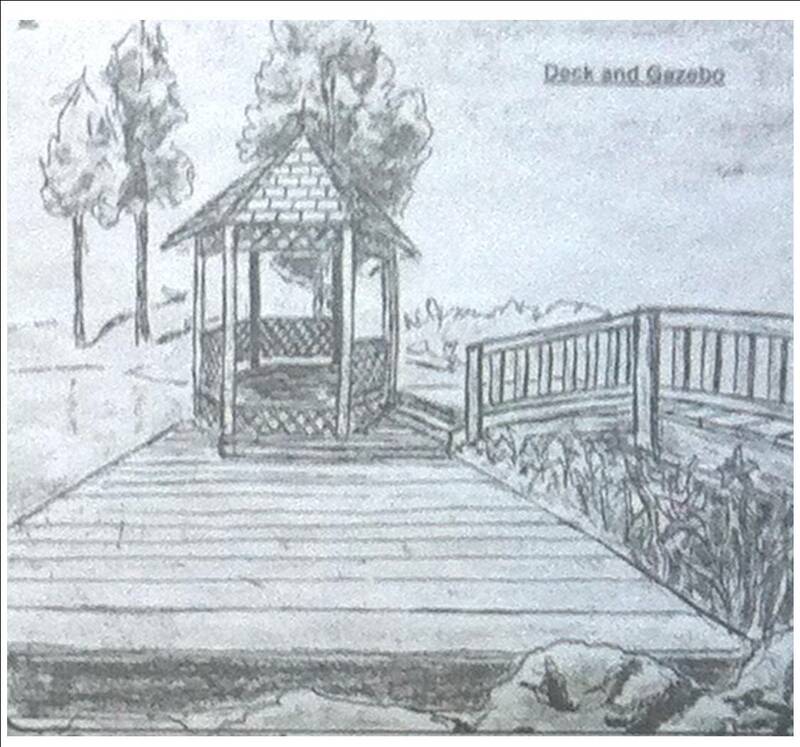 This week we’ll be talking about C. The Information Center and D. The Deck and Gazebo. Center is to provide a structure that houses bulletin boards/cases for postings by homeowners and notifications by the Association Board or its standing committees. 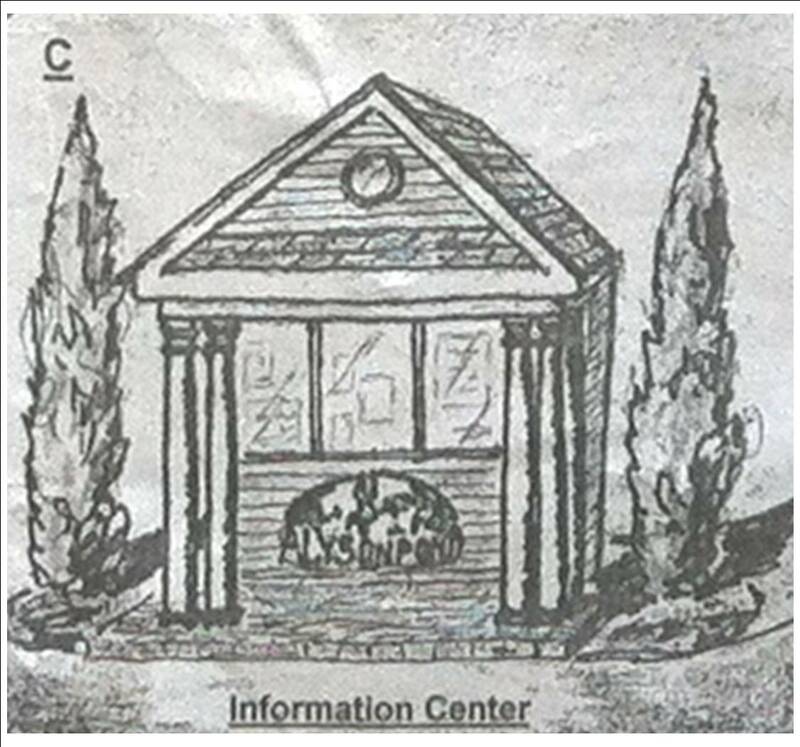 The appearance of the Center would be modeled after the Clubhouse entrance, with columns supporting a porch that protects the bulletin board / cases from the weather. The clapboard siding, paint and shingles will be chosen to match the Clubhouse. The back of the information center would have double doors for easy access to storage of signage, Holiday decorations, and other Association property that is currently stored elsewhere. is to provide a destination from which the pond can be more fully enjoyed. The deck would serve as a pier for fishing or tying up small water craft like canoes or kayaks. The gazebo provides a covered area from the sun where an observer can contemplate the vista or enjoy a casual lunch. The construction of both structures is of treated pine. The decking is finished in a translucent or transparent stain. The Gazebo structure is painted in a trim color to match the Clubhouse and shingled with matching asphalt shingles. Ten years ago the Alyson Board approved a Master Plan of capital improvement projects to be undertaken for the Clubhouse common area. The Plan was a result of input from the community and consists of two parts: 1) a graphical representation in plan view with some elevation details and 2) cost estimates for each of the projects. From this information, the Board subsequently adopted a funding mechanism whereby a portion of our homeowners’ dues would be escrowed for a Master Plan Fund. There is a recent occurrence of item 3. In its last regular meeting, the Board voted for a one-time reduction in the allocation to the Master Plan to divert funds to the general operating budget to forestall a dues increase for FY 2011.
to solicit new ideas for the planI will discuss two of the Master Plan Projects this week, and then one each week over the next four weeks. First, we may need to ask “Do we even need a Master Plan?”. There is already an escrow for replacement of existing structures. For example, the roof to the clubhouse will need replacement every so many years, the parking lot will need to be resurfaced every x years, the tennis courts will need to be repainted, and so on. Charleston Management has been tasked with reviewing our current replacement life and cost data for these existing items. This fund is separate and distinct from the Master Plan Fund but may need adjustment based on the results of this review. A Master Plan has several benefits. It enables us to identify projects that have long-term benefit to the community. It provides a basis for determining the cost of these improvements. It allows for the prioritization of projects based on the cost/benefit. Finally, it documents these decisions and serves as a long-term guide and plan to their implementation. Project A. Trellis The purpose of this project is to bring the pergola by the pool in compliance with Alyson Pond architectural guidelines. It includes removing the diagonal cross-brace, which is aesthetically unattractive and replacing it with a lattice structure to reinforce the posts, similar to a truss, to prevent racking. The second part of this project is to wrap the posts with fiberglass or comparable columns to match the Clubhouse columns. Project B. Fence and Gate At the time this project was adopted, it was felt that the Alyson Pond playground facilities were being used (and perhaps abused) by others who did not live in Alyson Pond. The fence was designed to deter others from accessing the playground area from the parking lot on Yucca Drive. It includes a six foot fence of ‘wrought iron’ appearance (either steel or aluminum) to extend from the corner of the pool house to the walkway by the parking lot and next to the lot to Yucca drive where it would connect with the existing section of fence protecting the dam overflow culvert and terminate at the residential property on the corner of Yucca and Wheeling. Entry into the playground area is through a custom double gate with Alyson Pond logo. 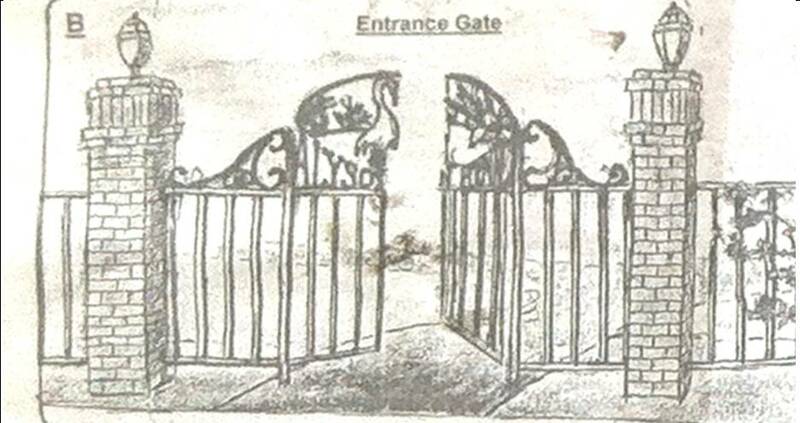 The gate is to be locked in a consistent manner as the lock to the pool fence. Brick columns flank the gate and are mounted at the corners and at intervals and in a style consistent with the existing columns around the pool. Note that the fence does not entirely enclose the playground area. It does provide a deterrent from casual access to the playground area and may protect smaller children from wandering into the parking area or being easily abducted by way of the parking lot. 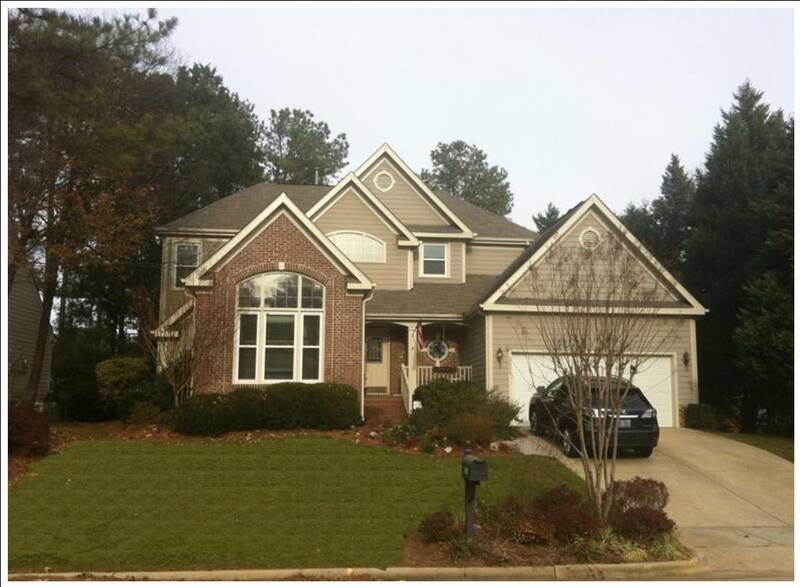 The Yard of the Month for November, 2010 is awarded to Bill and Donna Pappas. Their home, located at 2809 Coxindale (next to the Clubhouse), would have been a good choice for the award any month this summer based on the beautiful flower garden that Donna maintains. But what really set them apart this month was the newly completed renovation of the back yard. 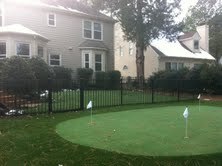 Here, they installed artificial turf to replace the struggling fescue lawn. “Ducks and dogs have take their toll” says Bill. “Now all I have to do is hose it down and it is as good as new”. In addition to easy upkeep, the lawn is environmentally friendly, especially at their pondside location. Runoff of fertilizers and pesticides is no longer a concern and this new addition will protect the water quality of Alyson Pond. 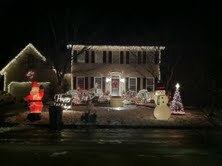 For December, Yard of the Month will be awarded to the home with the best Holiday display. So get out your lights, greenery, ribbons and bows! Judging will be conducted on Sunday, December 26, 2010. This article ran in the newsletter distributed last week, but I wanted to share it here as well. If you haven’t already taken a few minutes to fill in the survey (available here), we would greatly appreciate you doing so. The responses we’ve gotten back so far have been very helpful, and we want to make sure we’re hearing from as many of you as possible. Help us make Alyson Pond the best community possible! We had an interesting discussion at the last board meeting about the differences between young and more established neighborhoods. There is a universal transition from the early years, where everyone pitches in to help build the community, to a time where attendance at board meetings – and even the annual meeting – dwindles, where it gets harder to find people interested in serving on the board and chairing activities. On the one hand, I’d like to take the small turnout for board meetings as a sign that everything is going well and that there aren’t any major concerns or complaints. On the other hand, our community is going to need just as much help in its “teenage years” as it did in the first decade of its life… all the more so as the people who have given so generously of their time now look to hand things over to a new set of volunteers. To this end, we need your help in a few areas. Foremost, we want your opinions on what you like about Alyson Pond and what suggestions you have for further improvement. Attached you will find a short survey (which you may also have received via e-mail – if not, please write us at alysonpond@gmail.com to get on the list.) Please take a few minutes to fill it in and share your thoughts with us. At the annual meeting we will be looking to fill a number of open board positions. We are also going to try something new this year. Our board currently has 7 members, while our bylaws allow us to have up to 9. We are going to create two “at large” board positions that will have a one-year term and no specific duties (oversight of facilities, architecture, etc.) This is a great way to get involved and give back, with minimal additional time commitment on your part. There’s one more area where we need your help. 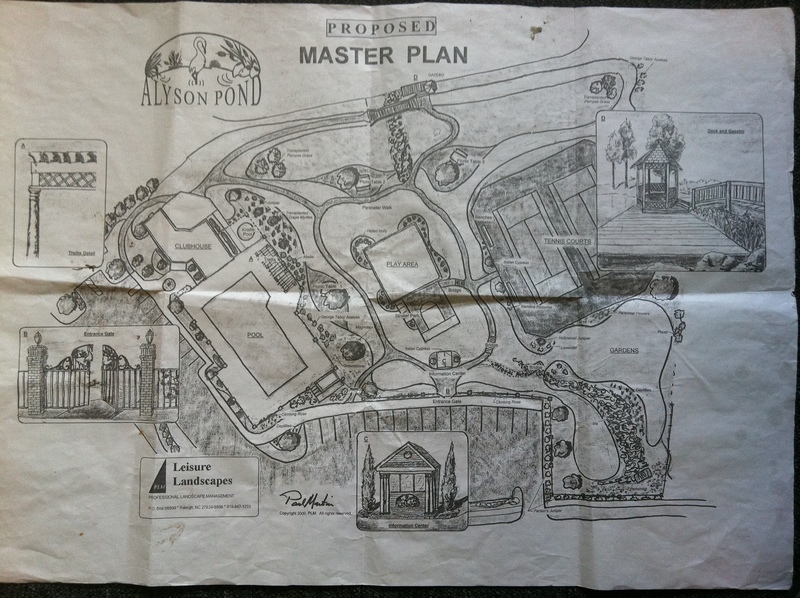 As you can read in more detail to the right, we are taking the opportunity to start revisiting the Alyson Pond Master Plan. Your input on this is essential. Thank you in advance for returning the surveys, and I hope to see you all on January 19th (if not sooner). Until then, happy holidays and Happy New Year.